Q: The first China-Afghanistan-Pakistan Foreign Ministers' Dialogue was held in Beijing yesterday. How do you comment on the outcomes and significance of this meeting? A: Afghanistan and Pakistan are China's traditional friends, close neighbors and strategic partners. We are bound by mountains and rivers as well as intertwined interests and cultural exchanges. It is only natural for the three neighbors to step up dialogue and cooperation. At present, Afghanistan is at a crucial stage of transformation and Pakistan is entering a critical period for stability and development, while China is vigorously advancing the Belt and Road Initiative. We regard Afghanistan and Pakistan as important cooperation partners and stand ready to make positive contributions to stability, security and development in Afghanistan, Pakistan and the region at large. Stronger dialogue and cooperation serves the common interests of the three parties and helps maintain regional peace and stability. The first China-Afghanistan-Pakistan Foreign Ministers' Dialogue, which was held in Beijing yesterday, produced a series of important consensus, as illustrated by Foreign Minister Wang Yi when he jointly met the press with Afghan Foreign Minister Rabbani and Pakistani Foreign Minister Asif. There is an eight-point consensus. First, the three parties will work to deepen the trilateral cooperation in accordance with the principle of mutual respect, equal-footed consultation and win-win results under the framework of the foreign ministers' dialogue. Second, the three parties agreed to achieve four goals, namely supporting the peace reconstruction and reconciliation efforts of Afghanistan; assisting Afghanistan and Pakistan in improving their relations; promoting common security of the three countries and the region at large; and advancing regional connectivity and cooperation on the Belt and Road Initiative. Third, Afghanistan and Pakistan agreed to expedite the improvement of the bilateral relations for harmonious coexistence. Fourth, the three parties reiterated their commitment to an Afghan-led, Afghan-owned reconciliation process. Fifth, Afghanistan and Pakistan reaffirmed their support for China's Belt and Road Initiative. They expressed their willingness to align their respective development strategies with the Belt and Road Initiative and discuss trilateral cooperation under the Belt and Road framework. Sixth, China and Pakistan will jointly launch assistance projects for Afghanistan in areas concerning people's livelihood like medical care and health, human resources and agriculture. Seventh, the three parties agreed to, in accordance with the consensus reached through the trilateral vice-ministerial consultation mechanism on counter-terrorism and security, enhance counter-terrorism coordination and cooperation in an effort to combat all terrorist organizations and individuals without any distinction of any sort. Eighth, Afghanistan and Pakistan agreed to strengthen communication between the Afghan Ulema Council and the Pakistani Ulema Council and prevent the spread and dissemination of religious extremism. Foreign Ministers of Afghanistan and Pakistan all expressed their appreciation for China's initiative to host this round of dialogue, China's continuous contribution to the development of Afghanistan and Pakistan and regional stability, and China's positive role in helping the two sides establish mutual trust and improve relations. They would take this dialogue as an opportunity to advance trilateral connectivity and practical cooperation under the Belt and Road framework. China is pleased with the outcomes of this dialogue, in particular with its role in strengthening dialogues, improving relations, building mutual trust and promoting cooperation between Afghanistan and Pakistan. 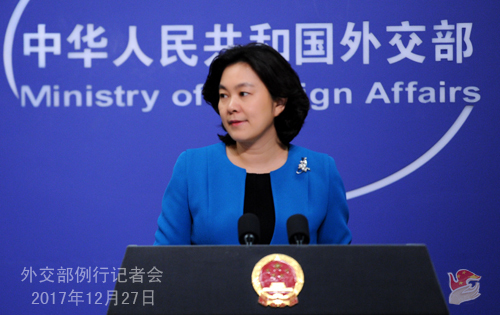 Q: Also about the first China-Afghanistan-Pakistan Foreign Ministers' Dialogue, we noticed that some media made a report titled "China looking to corner India? Beijing to extend CPEC to Afghanistan", while others commented that the extension of the CPEC into Afghanistan puts India on edge, as that will allow China's presence to reach deeper into Central Asia and connect with South Asia. What is your comment? A: As Foreign Minister Wang Yi said to the press yesterday, the CPEC targets no third party. Instead, it is expected to benefit third parties and the whole region. Afghanistan is an important neighbor to China and Pakistan. It keenly aspires to develop its economy, improve people's livelihood, integrate with the regional connectivity process, and leverage its geographic advantage to connect the CPEC with the China-Central and Western Asia Economic Corridor. In order to realize a larger-scale connectivity under the Belt and Road framework, the three parties agreed to proceed in incremental steps from easy and small projects to more difficult and bigger ones and identify concrete cooperation projects through equal-footed consultations to achieve common development and security as well as regional peace and stability. This is in line with the common needs and interests of the three countries. Trilateral dialogue and cooperation does not target any third party and shall be free from any external disruption or disturbance. Q: Some foreign media reported that satellite reconnaissance photos showed that Chinese ships were found trading oil with the DPRK ships at high seas, thus violating the DPRK-related resolutions of the UN Security Council. And I wondered if the Chinese government was aware of this and do you have any comment on this? A: I am not aware of what you mentioned. But I would like to know whether the relevant media could specify which ship or ships were involved in the situation? Are they on the sanctions list of the United Nations Security Council? If not, what made them conclude that these ships violated the Security Council resolutions? Any solid evidence? Moreover, these media may think about whether their own country can be 100% sure that what should be done is done and not a single breach will happen? China's relevant position remains unequivocal. I would like to reiterate that the Chinese government has been comprehensively, accurately, faithfully and strictly implementing the Security Council's DPRK-related resolutions. Our attitude is earnest and serious, and our measures and actions are forceful and effective. If there is solid evidence proving that there is on the Chinese side any violation of the Security Council resolutions, China will surely deal with it in accordance with laws and regulations, and not a single case of violation should get away with it. I also have a piece of advice for the relevant media. Instead of fixing their eyes on Chinese ship, they had better ask their government that whether it has fully and comprehensively implemented the relevant Security Council resolutions? Or has it been doing so in a selective manner? All the previous DPRK-related Security Council resolutions call for a peaceful, diplomatic and political settlement to the issue, stressing that relevant parties should take measures to deescalate tensions on the Korean Peninsula. You may want to think over this: is every party concerned working hard to comprehensively implement the relevant Security Council resolutions in entirety? We hope to see comprehensive and complete implementation of those resolutions: not just measures taken to curb the DPRK's nuclear and missile development, but also more positive and constructive efforts to - bring the tense and runaway situation on the Peninsula back on the right track of peaceful settlement through dialogue and negotiation. Q: The Pakistani Foreign Ministry has urged India to respect 2003 ceasefire agreement after Indian forces crossed the Line of Control in the Kashmir region and killed three Pakistani soldiers. Pakistan also urged India to allow the United Nations Military Observer Group in India and Pakistan (UNMOGIP) to play its mandated role as per the UN Security Council resolutions. What is your comment? A: We noted relevant reports. 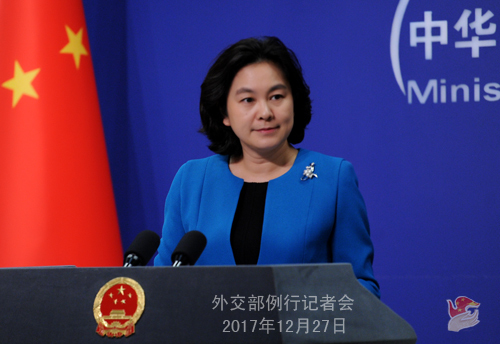 As a common neighbor and friend to both Pakistan and India, China hopes that the two sides could calmly and properly deal with the relevant issue through dialogue and consultation and jointly work for peace and stability in South Asia. Q: In an interview, the German ambassador to China Michael Clauss touched upon some issues in the China-German relations. He mentioned specifically that Germany and China agreed to establish a consultation mechanism on cyber security in June 2016, but up to now, this consultation mechanism has not yet seen the light of day due to a lack of sincerity to talk on China's part How do you respond to these remarks by the German Ambassador? A: Ambassadors are supposed to respect the countries they are stationed in and act as bridges to promote understanding, friendship and cooperation between the two sides. Frankly speaking, this ambassador in question is not acting in that vein and his words and deeds are far from constructive and in fact very wrong. Some of his arguments cannot be further from truth and even worse, they confuse right and wrong. I want to highlight that China has always been open to exchanges and cooperation with Germany on cyber security issues. The truth is that this June, in-depth exchanges and communication on these issues did take place during the first high-level security dialogue between China and Germany. The Chinese side has repeatedly invited the German side to visit China for consultations. Instead of sending any delegation, the German side accused China of lack of sincerity for dialogue, which is absolutely unreasonable. I believe that Mr. Clauss, as the Ambassador, must know all of these very well. We hope that the German Embassy and the relevant person avoid such these unprofessional and irresponsible remarks and do more to promote China-German relations and mutually beneficial cooperation. Q: Japanese media recently reported that China and the US are planning to establish a military hot-line between the Chinese military and the US forces in South Korea to handle the situation on the Korean Peninsula. Chinese media, at the same time, reported that this was fake news, saying that it was a product of pure imagination. Could you make any comment on that or confirm those reports? A: You mentioned the media reports from Japan and China. Military hot-line falls under the remit of the Defense Ministry. So, I would refer you to them. Q: With regard to the trilateral meeting of China, Afghanistan and Pakistan yesterday, Foreign Minister Wang Yi has been involved in the shuttle diplomacy between the two countries for a while. Since June, he visited both countries and now the first-time trilateral meeting was held. Have the differences between Pakistan and Afghanistan been sorted out? The Afghan officials say there is no respite of violence across the Afghanistan-Pakistan border. Is the trilateral meeting going to bring peace between the two countries? A: With regard to the first China-Afghanistan-Pakistan Foreign Ministers' Dialogue, there are more than enough details in the press reports. 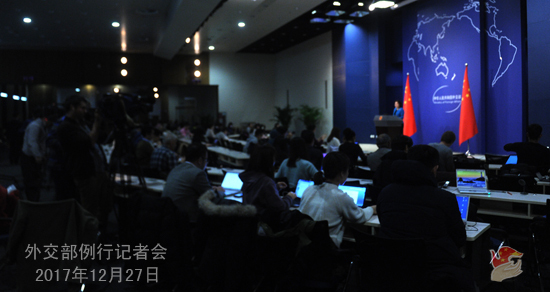 Foreign Minister Wang Yi also talked a lot about it at yesterday's joint press conference. I want to highlight the following points: it is highly necessary and important for the three neighbors to strengthen dialogue and cooperation. You mentioned that Foreign Minister Wang Yi conducted shuttle diplomacy between Afghanistan and Pakistan. We did have made enormous efforts. China has proposed to establish the China-Afghanistan-Pakistan dialogue mechanism, one purpose of which is to improve relations between Afghanistan and Pakistan and realize common development and security. The Afghan and Pakistani sides all expressed their appreciation for China' efforts to seek improved relations, strengthened dialogue, deepened mutual trust and more cooperation between Afghanistan and Pakistan, which can be said as another important outcome of this dialogue. The three foreign ministers also exchanged views on security cooperation and counter-terrorism, reaffirming their willingness to enhance counter-terrorism cooperation and commitment to step up counter-terrorism coordination and cooperation to combat terrorism in all its forms and manifestations in accordance with the consensus reached through the trilateral vice-ministerial consultation mechanism on counter-terrorism and security. The positive meaning of the first China-Afghanistan-Pakistan Foreign Ministers' Dialogue is obvious. Q: Regarding the trilateral cooperation and China playing a mediating role between Afghanistan and Pakistan. A few days ago, the heads of Palestine and Israel also came here and China played a positive role in trying to get them together. Is this mediation in global hot-spots a new trend in Chinese diplomacy and is this connected to the community with a shared future for mankind which President Xi spoke about in the 19th Party Congress? A: The 19th National Congress of the Communist Party of China put forward the building of a community with a shared future for mankind, stressing that China will deepen relations with its neighbors in accordance with the principle of amity, sincerity, mutual benefit, and inclusiveness and the policy of forging friendship and partnership with its neighbors and proactively promote the Belt and Road international cooperation. This injects robust and new impetus into the stronger cooperation between China, Afghanistan and Pakistan. China's proposal for the China-Afghanistan-Pakistan Foreign Ministers' Dialogue aims to promote common development and security of regional countries. We will continue to explore solutions with Chinese characteristics to hot-spot issues and play a constructive role in promoting peace and development of the region and beyond. When meeting with the press yesterday, Foreign Minister Wang Yi stressed that the China-Afghanistan-Pakistan Foreign Ministers' Dialogue neither seeks to replace existing mechanisms nor targets any other party besides the three countries. We are willing to coordinate and cooperate with other mechanisms to give full play to respective advantages and seek synergy and jointly make contributions to the peace and stability of Afghanistan and the region. Q: Not long ago, Foreign Minister Wang Yi was in India for the China-Russia-India Foreign Ministers' Meeting, followed by the border talks in which various issues have been discussed. Were there any discussions about the CPEC over which India has repeatedly expressed its objections to it? Was there any discussion about resolving these differences? A: As to the issues that came up in the recent high-level interactions between China and India, we released the readouts in a timely way. Be it the Meeting of Special Representatives on China-India Boundary Issue chaired by State Councilor Yang Jiechi in India or Foreign Minister Wang Yi's visit to India, the messages sent out on these occasions are all positive. The two leaderships have grasped the importance of China-India relations from strategic and long-term perspectives. The two sides also share the same aspiration and view that it serves the common interests of the two countries and is conducive to regional peace and stability to maintain steady and healthy development of China-India relations. The two sides should make full use of the existing mechanisms to strengthen communication, enhance mutual trust, handle relevant differences on the basis of mutual respect and create conditions for the sound development of bilateral relations. As regards the CPEC issue, we have stated our position multiple times. The CPEC does not target any third party. Instead, it is expected to bring benefit to a third party. It is an economic cooperation project and should not be politicized. It has nothing to do and is not supposed to have anything to do with the existing disputes in the region, including territorial disputes.